Colorful. Crunchy. Sweet. There’s probably no candy in America more iconic than M&M’s. The hard-shell, chocolate candies debuted 76 years ago. At first, they were sold only to the U.S. military as part of soldiers’ food rations during World War II. That’s a suitable beginning for a candy that the late Forrest Mars Sr. envisioned after observing soldiers in the Spanish Civil War. They ate small chocolates with a hard sugar coating that stood up well to heat. Mars patented his own process for that type of candy, and the rest is history. When World War II ended in 1945, Mars Inc. rolled out M&M’s to the public. By 1956, M&M’s had become the No. 1 candy in the country. Today, it’s a billon-dollar brand available in a range of colors, fillings and flavors in more than 100 countries. This May brought another big launch: the release of Caramel M&M’s, the first with a soft and chewy center. 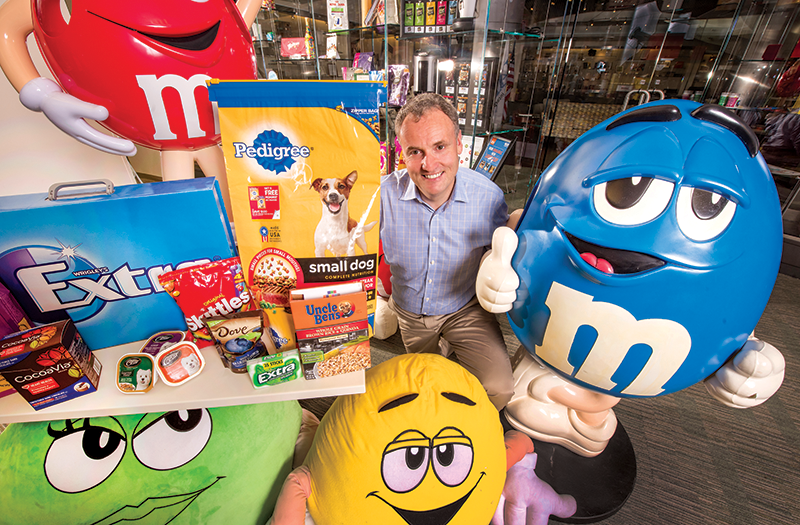 M&M’s is a billion dollar global brand — one of ten billion dollar brands in Mars’ food and pet-care businesses. The others include: Snickers, Twix, Orbit/Extra, Dove/Galaxy, Banfield, Pedigree, Whiskas and Royal Canin, and VCA Inc.
Mars is Virginia-based, operating from its corporate headquarters in McLean. The two-story, brown-brick building isn’t plush as headquarters go, but there is a tasty perk: free snacks, including a cold case in the reception area stocked with Mars ice-cream confections. With so many big brands, it’s not surprising that the fourth-generation, family-owned business ranks as the sixth-largest private company in America, with $35 billion in annual sales and 85,000 employees in 80 countries. 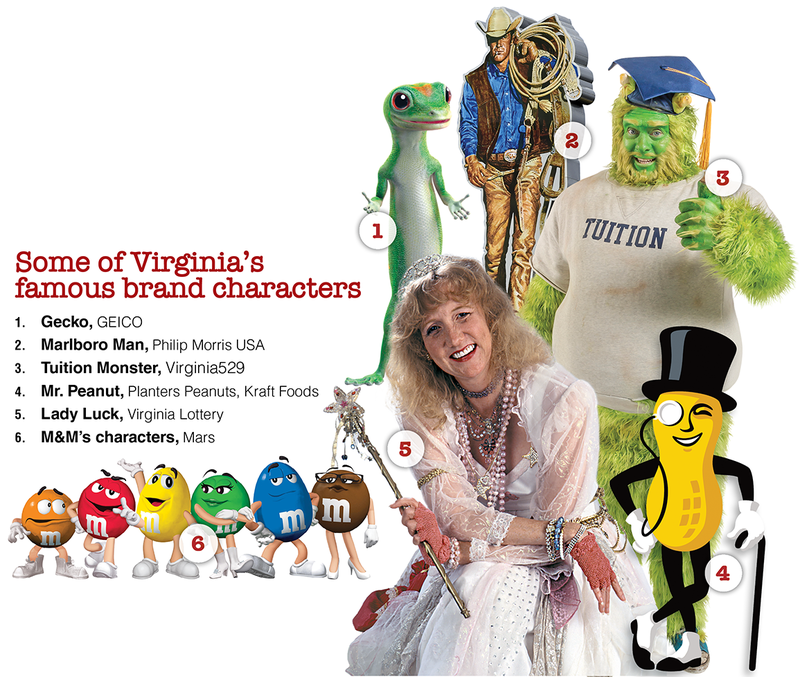 Yet when it comes to winning brands, Mars has plenty of company in Virginia. From the macho Marlboro Man to a rambunctious group of Vikings who promoted Capital One credit cards, Virginia companies have a history of standout products and slogans. Martin & Woltz Inc., The Martin Agency’s predecessor, also came up with “Virginia is for Lovers,” the slogan of Virginia’s state tourism agency. The iconic catch phrase, created in 1969, remains in use today and is ranked by Forbes.com as one of the top 10 tourism brands of all time. Virginia also is home to the No. 1 ranked graduate school in brand management, the Brandcenter at Virginia Commonwealth University. With so much homegrown talent, Virginia is proof that glam brands can originate from places other than New York’s Madison Avenue. So what is the secret behind branding? How does it drive sales? And what is the role of social media in promoting today’s brands? Next, Mars focuses on the customer and strives to keep the product relevant. Take the case of the blue M&M. In 1995, Mars invited people to participate in a color contest, weighing in on the selection of purple, blue or pink for a new variety of M&M’s. Blue captured the most votes. To help announce the people’s choice, Mars bathed the Empire State building in blue light. The company also continues to invest in research and development. Mars spent $270 million to open a manufacturing plant in Topeka, Kan., in 2014, its first new manufacturing plant in North American in 35 years. The company invested another $100 million in the 500,000-square-foot plant the next year for the Caramel M&M’s production line. Mars is deeply committed to sustainability. It is working to have all of its cocoa come from certified sustainable farming operations by 2020 and to have its manufacturing operations powered by carbon-free energy by 2040. To that end, the company has built two large wind farms in Texas and Scotland to provide 100 percent renewable energy to its operations in the U.S. and the UK. Rather than power Mars’ operations directly, the wind farms provide the company with renewable energy certificates transferable for electricity use in these facilities. In September, Mars announced another bold initiative: a $1 billion, Sustainable in a Generation Plan. Over the next few years, the company plans to fight climate change by further reducing greenhouse gas emissions, and it wants to reduce poverty by improving wages for the 1 million people who produce the raw materials for its products. Pharoah won’t say what Mars spends annually on branding and marketing. Nor would he reveal which Mars’ product generates the most revenue. He did note, however, that the majority of the company’s sales now comes from its pet-product and pet-care divisions. 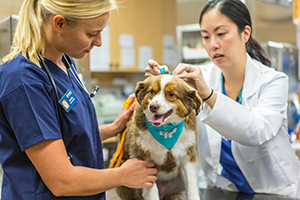 This sector is poised for continued growth with Mars’ recent $9.1 billion acquisition of VCA Inc., a chain of 800 small veterinary hospitals in the U.S. and Canada. When compiling its 2017 list of top brands, Brand Finance, a London-based valuation and strategy consultancy, said Marlboro remains Virginia’s most valuable brand. Even with strict federal regulations on marketing and advertising, Marlboro is the most valuable tobacco brand in the world, according to the consultancy. Asked about Marlboro’s dom­­­­­inance, Anne Bahr Thompson, a managing director of strategy in Brand Finance’s New York office, says declining demand for cigarettes in Western markets is offset by growth in other parts of the world, such as China, Indonesia and Africa, “where regulation remains weaker. “Like some other well-known tobacco brands, Marlboro may be able to rely on long-standing iconic heritage and familiarity among consumers to mitigate the effects of plain packaging. This will provide a significant competitive advantage over smaller, unknown tobacco brands who will struggle to penetrate new markets,” Thompson says in an email. Henrico County-based Altria Group, the parent company of Philip Morris USA, won’t comment on outside estimates. However, spokesman George Parman confirms that Marlboro has been the leading U.S. cigarette brand for more than 40 years and is the retail share leader in all 50 states, with about $34 billion in sales in 2016. Today, the image of a cigarette-smoking cowboy astride a horse will forever be associated with Marlboro’s tough guy image. Ironically, Marlboro was originally marketed as a women’s cigarette. The cigarette was advertised as being as “Mild as May” until 1954 when Philip Morris decided to reposition the product for broader appeal. The company hired Leo Burnett, a Chicago advertising executive, for the rebranding. The Marlboro campaign was conceived as a way to popularize filtered cigarettes, which until 1954 had been marketed only to women. What better way to counter a feminine image than with commercials of cowboys herding horses, men in Army fatigues or bikers riding Harleys? The Marlboro Man campaign went national in 1955 and continued in the U.S. until about 1999, when a master settlement agreement between major tobacco companies and 46 states put stringent restrictions on cigarette advertising, due to health issues associated with smoking, especially lung cancer. Philip Morris USA doesn’t use the Marlboro brand on any tobacco products except cigarettes. Protecting a brand’s identity is key. “There’s no faster way to destroy a brand than to not deliver on the promise of that brand,” says Matt Williams, CEO of the Martin Agency. Just look at what happened recently to the Chipotle Mexican restaurant chain and United Airlines. In both cases, say experts, their brand promises took deep hits when, through social media, consumers saw rodents on the floor of a Chipotle restaurant in Dallas and witnessed a 69-year-old passenger being dragged off an overbooked United flight. “Great brands need to be as consistent as they can, not just in their messages, but in their experiences,” says Kelly O’Keefe, a professor of brand management at VCU. Brands can recover from disaster if companies respond appropriately. Williams points to the classic textbook case of the Tylenol poisoning murders in 1982. Seven people died as the result of drug tampering, with some of Tylenol’s acetaminophen capsules tainted with potassium cyanide. Johnson & Johnson, Tylenol’s manufacturer, spent millions pulling all its product off the shelves and said, “We’re going to do what needs to be done to make sure you and your family are safe,” recalls Williams. The incident later led to reforms in packaging of over-the-counter medications, such as tamper-proof seals. One reason the long-running Geico campaign has been so successful, Williams continues, is because the company remained true to its brand promise. The firm, which began under the name of the Government Employees Insurance Co., has a “direct” insurance model, which helps to lower prices. Customers can call the company directly 24 hours a day, 365 days a year, for help and information. 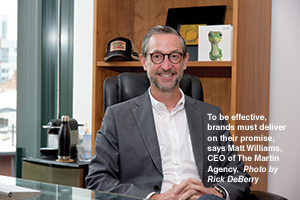 As the company has grown, Geico has added a few agents, but overall the model remains the same. Helping to deliver the message of lower insurance prices is the Geico Gecko, a green lizard with a British accent and a penchant for humor who shows up in all kinds of places. When the Martin Agency started with Geico in 1994, the company ranked eighth in the industry among auto insurers. “Now it’s No. 2, with State Farm the only one ahead of them now. [They have]been the fastest-growing car insurance company for 12 years running,” says Dean Jarrett, Martin’s chief of communications. This is true of Apple, he says, through its products, manufacturing, packaging and distribution. Before the digital age, brands typically would be bolted on to the product after the fact. “It was almost the reverse of how great brands work now,” observes Rothermel. Another example of modern value-based branding is CarMax. Caley Cantrell, the head professor on strategy at the BrandCenter, points out that CarMax in Henrico County reimagined what it meant to buy a used car. With its no-haggle pricing, “I don’t think a lot of people even think of it as a place to buy a used car; they’ve evolved beyond that. It’s a place of great service,” says Cantrell. In the midst of the digital shift, advertising and marketing agencies are getting more innovative. For instance, during a 34-minute power blackout during the 2013 Super Bowl, the creative team behind Oreo cookies tweeted, “You can still dunk in the dark.” The tweet packed more of a punch than Oreo’s actual Superbowl ad. The original Twitter message was retweeted 10,000 times in one hour. The Martin Agency also has won awards for its use of pre-roll ads — those ads that pop up on the Internet before people can get to the content they searched for. Many people hit the skip button to avoid such ads, but Martin did an “unskippable” pre-roll ad campaign for Geico, and tried to turn this premise on its head by making the ads so memorable and humorous that people didn’t want to skip them. The ultimate goal for any brand is what’s known as brand equity. “Brand equity is the magical thing that happens when someone says ‘give me a Coke,’ when they mean any sort of soda, or ‘give me a Kleenex’ — when they actually substitute the brand name for a product or service,” says David Saunders, founder and president of Madison+ Main, a branding, marketing and public relations agency in Richmond. Still, with all the change, Williams says the essence of a brand hasn’t changed. “A good brand is still a set of images and associations attached to a company or product that appeal in a unique way to the people they want to appeal to.” Yet, how brands live in today’s world, he adds, is completely different, because there are so many consumer touch points via tablets, smartphones, social media and apps.